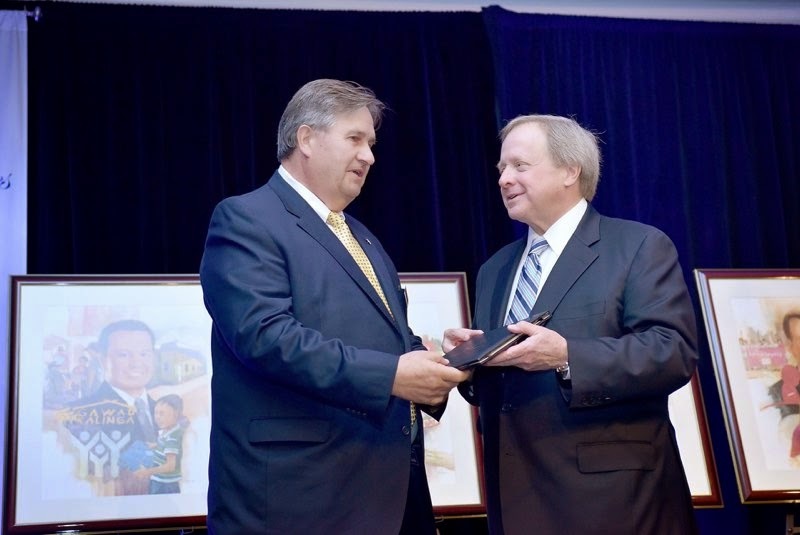 On January 22nd, 2015, Gary Uftring, of Uftring Ford in East Peoria, Illinois, was one of six dealers worldwide recognized by Ford Motor Company as a 2015 "Salute to Dealers" honoree. Gary accepted the award at a reception preceding the 2015 NADA Convention in San Francisco, California. Salute To Dealers is a Ford Motor Company initiative that identifies and honors Dealer Principals who are dedicated to giving back to the communities in which they live and work. Throughout his career, Gary Uftring has always led by example. Every day, each day we are reminded how many lives Gary Uftring has touched with his generosity and willingness to help others. All of us at the Uftring Automall and in the entire Uftring Auto Group are extremely lucky to have such a compassionate and caring individual leading our organization. Gary's Uftring's commitment to giving back to Central Illinois has touched countless individuals, organizations and families. The Uftring Ambassador Initiative was created five years ago to better serve Central Illinois communities using the resources and dedication of the Uftring Auto Group team. In addition to the many walks, food drives and charitable donations, recent efforts have included helping countless local residents impacted by the November 2013 Tornado and raising thousands of dollars for The Central Illinois Center for the Blind and Visually Impaired at two successful Get in Gear Race and Tailgate events. The Salute to Dealers awards were launched in 2001 to demonstrate Ford's commitment to its thousands of dealer owners who step beyond their showroom doors to make a difference. This year, Edsel B. Ford II and three other judges selected six winners from a total global field of 80 nominees located in the United States, Canada, Brazil, Europe, Asia Pacific, the Caribbean, Mexico and Central America, Africa and the Middle East regions. A painted portrait of each honoree features a montage of philanthropic and volunteer activities that led to the award. Duplicates of the portraits will join a Salute to Dealers display in the lobby of Ford World Headquarters in Dearborn, Michigan. Mr. Uftring will be proud to display the portrait at his East Peoria, Illinois Ford dealer, Uftring Ford in the Uftring Automall. We would like to extend our most sincere congratulations to Gary for such a significant honor and achievement.